How to Speed Up Your Mac For Free! We all know the feeling of a new computer… everything is super quick, and there are no bugs or problems to be found. 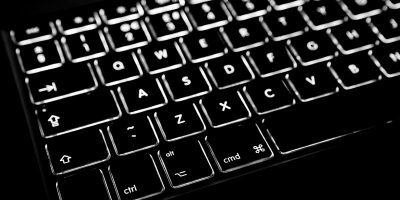 Even if you have a Mac though, which are by reputation more durable than a PC’s (if only for their relative sparse nature on the internet), you often still find that a year later, that feeling is usually gone, only to be replaced by an entirely different one. This one is often frustration and confusion. How and why did this premium computer I bought get so slow, and how do I fix it? Plenty of services will do it for you for $50 or more, but why pay someone else to do things you can easily do yourself? One of the biggest things that can bog down someone’s machine without them even realizing is applications that run on startup. The first thing to do is to make sure you’re not hogging system resources with unused applications. 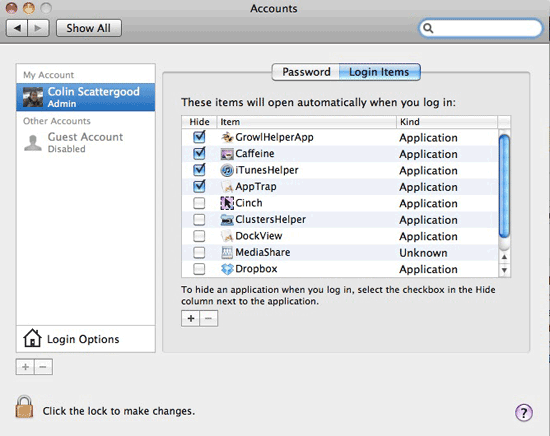 Open System Preferences (hit “Command + Space” and type “System Preferences”, then hit Enter) and go to Accounts. Choose your Login on the left, and on the right hit the Login Items tab at the top. Check the list of apps, and be honest with yourself about how much you use them. I always say, if I don’t use something once a day or more, then it doesn’t deserve to be in the startup list. If there is something on this list that you don’t use often, highlight it and click the minus sign at the bottom to remove it. The last step is to press Command + Space for the spotlight, but this time type in Activity Monitor and hit Enter. This will bring up a list all the processes currently running on your computer. Look for anything that you can identify and that you don’t use, and quit it. Don’t quit the Activity Monitor yet though! The last thing you want to check is the Dashboard. 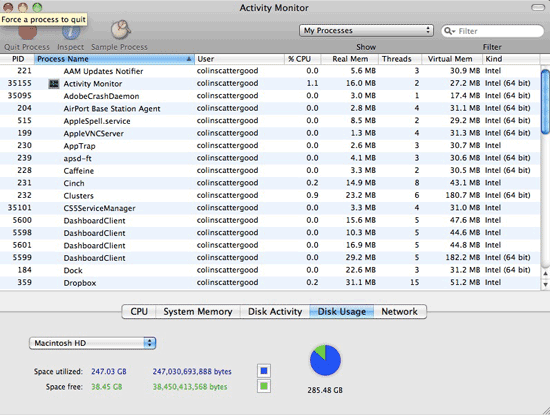 Even though its a built in part of OS X, it can be a serious memory hog. Dashboard runs with the Dock, but only once you start it up on purpose. The problem is that there is no way to quit it except by doing it manually. In your Activity Monitor, select Dock and hit Quit Process then Force Quit. 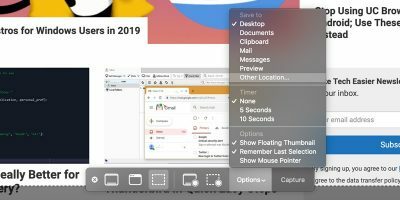 This will restart your Dock, and shut your Dashboard off until you call it up again, possibly saving you a ton of memory if you’ve got a lot of Widgets running. I know what you’re thinking… Mac’s don’t get viruses. Unfortunately, this is a myth. Macs can be infected as well, even though it is not easy for virus to get onboard. To get rid of any viruses or spam/adware your Mac currently has, I suggest iAntiVirus. It’s free, and does everything you could need it to, with a simple, understandable interface. If you really want to lock down network security as well, try Little Snitch. 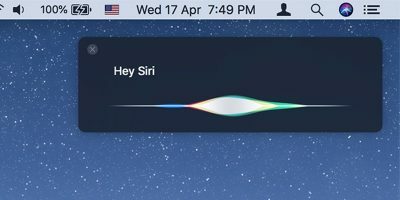 It can be downloaded for free too, and will alert you to literally all network traffic into and out of your Mac, allowing you to Allow or Deny any one application or service. One thing people don’t realize is that having too little disk storage space left on your Mac’s hard drive can really bog down your computer’s performance. 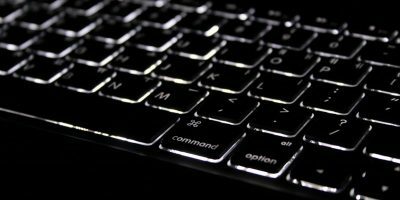 There are a multitude of reasons this can have negative effects on your Mac’s performance, but without getting too technical, the more space, the better. The most obvious thing to recover the hard disk space is to uninstall those applications that you no longer use. 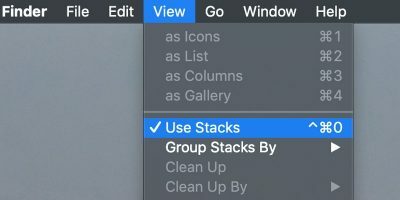 Go to your Applications folder and drag those applications that you don’t use anymore to the trash (you might consider installing AppCleaner). The next thing you can do, and this is a biggie, is offload music, movies, and photos to an external hard drive. 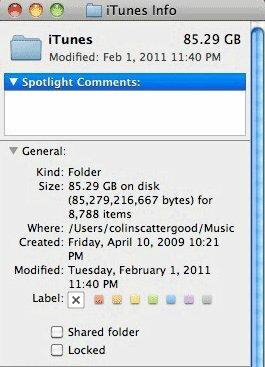 These media files probably took up tens, or even hundreds of gigabytes. Offload them to an external drive and keep your external drive close to your Mac. If you use iTunes, your Movies and Music are all in essentially the same location on your drive, and you can use Apple’s guide to move your collection. For many people, this will make a huge difference in their hard drive’s available space. 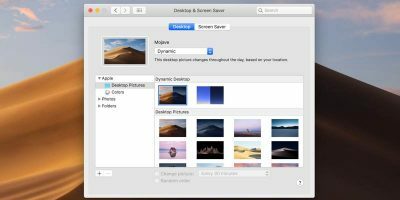 To move your iPhoto library, follow Maclife’s tutorial. 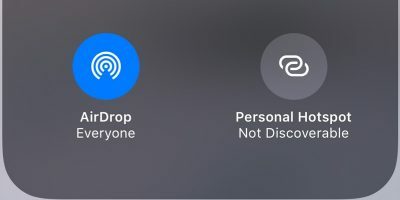 It’s super quick and easy, as Apple has realized people’s need to use external drives and designed the programs to cooperate with them. So what do you all think? 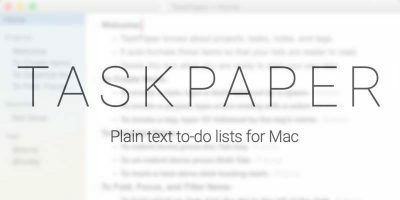 Know any other great ways to speed up a Mac? I know I didn’t hit everything, so let us know in the comments! I have to disagree about iAntivirus. That application is completely abandonware. It never worked properly (look at the user forums for the CPU usage problem – I was a frequent poster there) and PCTools never fixed it. People have even stopped complaining about it (the forums are totally silent these days), because it is so clear that the software is dead. Instead, Mac users wanting to checking for viruses should be using ClamXav (open source and free). I’ve used ClamXav as well, but I have to say I’ve been using iAntivirus for I guess about 6 months and have seemed to have any issues with it. Guess it can be hit or miss? Nice read, thanks for the great contribution! I am a movie editor. So, speed matters a lot for me. In the beginning I was very comfortable with my Mac but just after six or seven months is started running very slowly. I scanned for virus but not found. Finally I used a third party tool to remove all the unused data and applications from my Mac and it worked. And why would you scan for a Virus on a Mac. It is not nor will it ever be a Virus burdened PC. I have yet, nor anyone I know of for that matter that uses a Mac has gotten a Virus of any sort in my 10+ years of making the Switch. Don’t misunderstand, a lot of PC’s are great tools, but Windows oriented software always has been the Problem. If your Mac is running slow, check the Hard Drive Capacity or Ram and everything in between, but if your expecting the Problem to be from a Virus, well Macs cost what they do for a Reason IMHO. Are you saying macs can’t get viruses? You truly are ignorant. I know that my system runs smoothly, and I’m a graphic designer. Thanks for the addition. They are useful. I use it at work mostly, but I also run it on my macbook every once and a while. You can find it in Apple’s Download section.